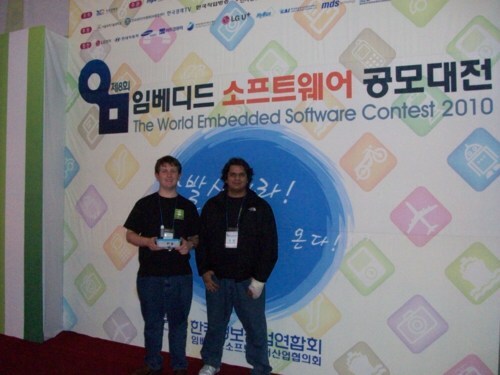 This post is part of a series of journals I wrote while traveling to Seoul, South Korea to compete in the 2010 World Embedded Software Contest, for which my team’s project won the grand prize. AutoPlug booth all set up! Me, Kai, and Madhur ready for the competition! We were having some difficulties with our demonstration. 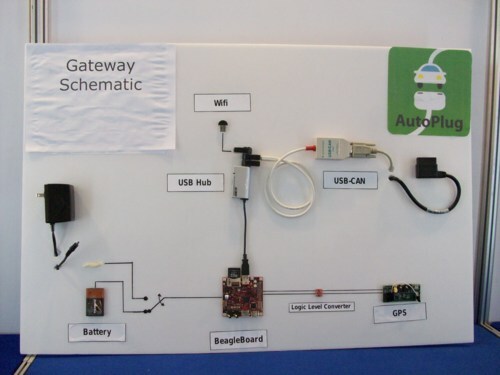 The set up involves the blue-box gateway being connected to a monitor. When you open the myMechanic app on the iPad, the gateway starts playing a video of a car driving around Philadelphia on the monitor that is synchronized with the data being sent to the iPad. However, the monitor kept going to sleep on us, because of the power settings of the gateway. We weren’t sure how to change the power settings since the Ubuntu running on the gateway is command-line-only (no GUI software is installed), so it looked really bad when the monitor just cut out during our demonstration. I asked Kai for a USB keyboard and she made some calls to try to get us one. In the mean time, we tried to run our demo as soon as the judges approached so that it would not cut out while they were there. 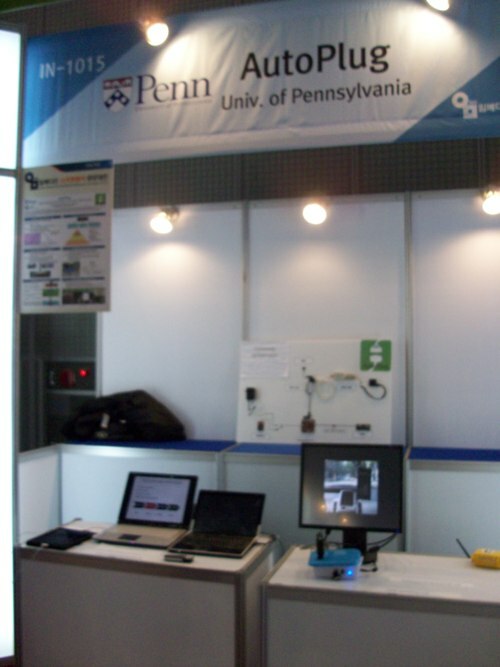 Demo setup: Gateway showing synchronized video of driving around Philly. At some point in the morning the first group of judges came by. They actually spoke English so Kai just stood there in case they didn’t completely understand something. We gave them our presentation and they didn’t seem to react much at all. 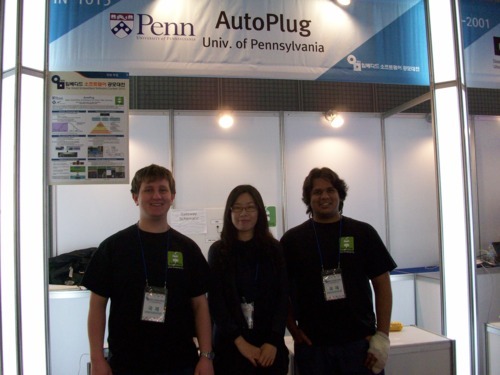 At the end one of the judges asked us to show him a demo of a plug-n-play device working with AutoPlug. We had to tell him that we haven’t implemented one yet. So we didn’t think we did a very good job with the first group of judges, but I talked to Jenny from the Serval team and she said it was about the same for them. Opening ceremony. I wish they had translated all of it into English for us. At noon we broke for lunch and went to the Food Court again. This time we asked Kai to order some bibimbop for us. It was difficult to find a seat since so many people from the competition were eating there as well. The bibimbop was pretty good. We asked Kai about the North Korean attack the day before. She said that stuff like that happens a lot, but this time she was more nervous because they attacked civilians. She thought it was good that we were leaving in a few days in case anything else happened. After lunch we finally received the USB keyboard. This allowed us to login to the gateway directly instead of remote connecting in using one of our laptops. The ability to login directly would let us press a key on the keyboard if the monitor went to sleep. Our second group of judges came by for a presentation, and this time it was much better. The presentation was great, the demo was great, and all the judges took the AutoPlug SDK discs we had made (thanks Susan and Anish!). After that group of judges, we took some time to walk around and look at the domestic teams’ projects. 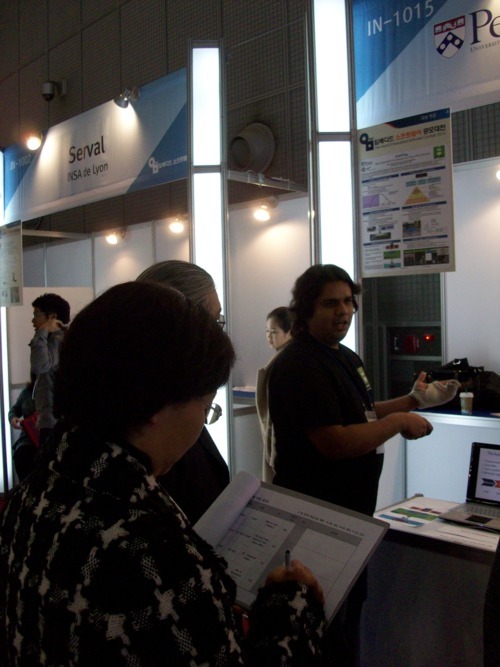 There were some very cool demos. 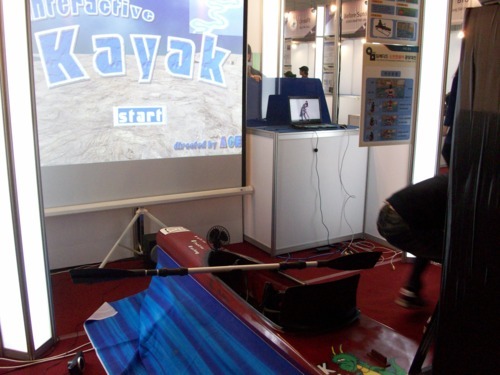 One group had a kayak gaming experience with a kayak you sit in and a paddle controller. The kayak actually moved around and there was a fan that blew air on you and you could see where you were going on a projector screen in front of you. 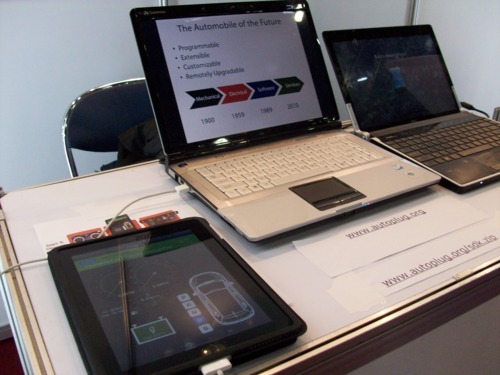 There were two teams with table-top touch screen interactive computers. 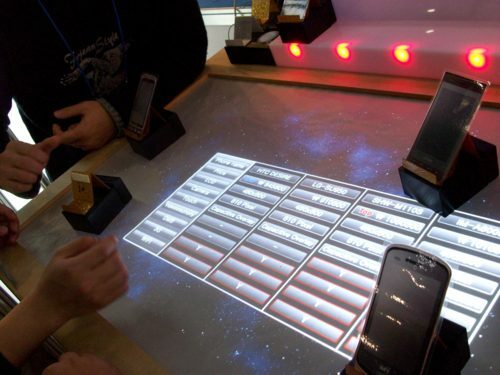 One was meant for phone companies to show off their phones, so you would put a particular phone on the table and the table would recognize it and show information, pictures, and video about it. 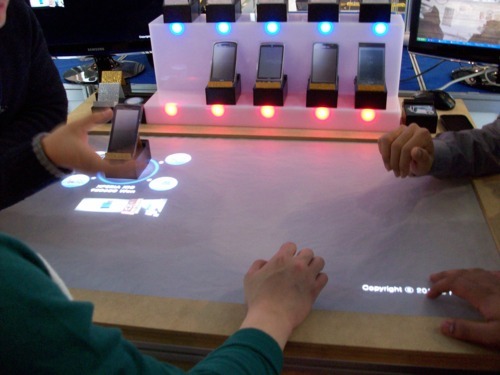 Then if you put multiple phones on the table you can compare and contrast different models, very cool! 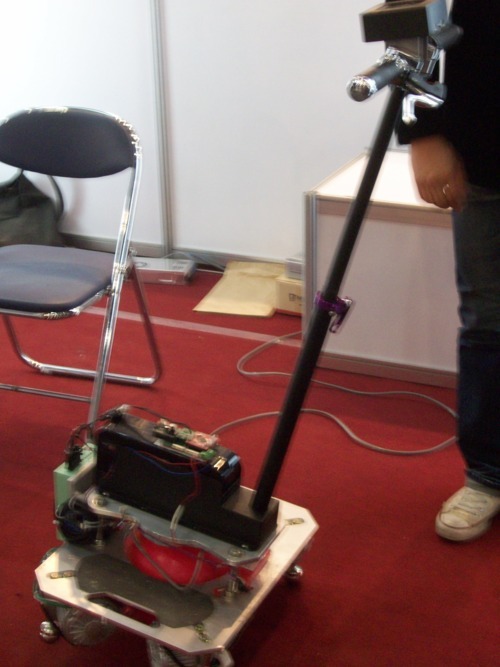 There were also tons of robots, at least 5 quadrotor helicopters, and a ball segway. 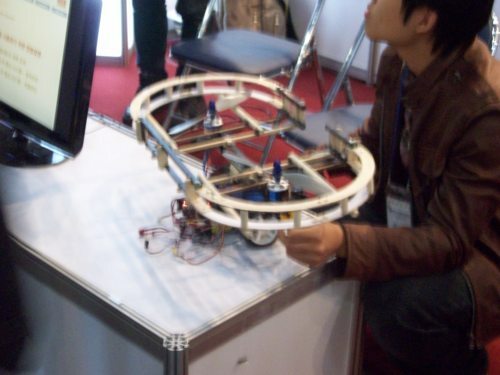 Birotor helicopter + RC car = awesome! 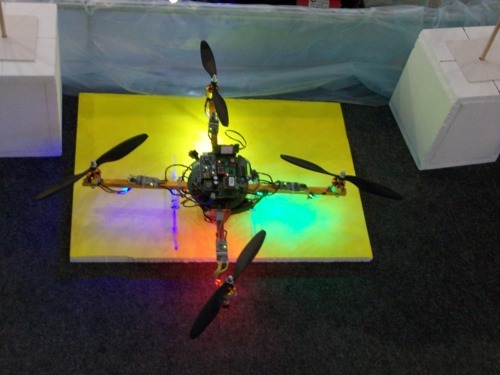 There were so many quadrotors! This might have been my favorite. 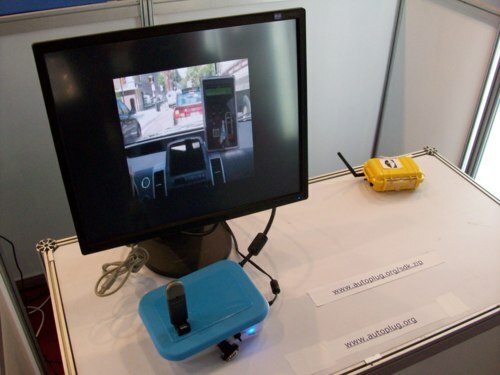 Table-top touchscreen computer for phones. Put several phones on the table and compare/contrast their features! 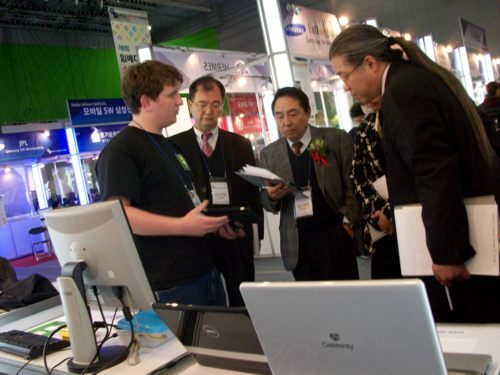 There was one more group of judges near the end of the competition, but we had already packed up our demo materials so we just gave them the presentation. I think we did pretty good overall in the competition, but it really depends on what the judges were looking for. If they were looking for a really cool toy or physical demo, then we probably didn’t win anything. But if they were looking for a groundbreaking open source concept, then maybe we will end up winning something. (most of) the international team members! Great job guys! Madhur and I got to be pretty good friends with a guy named Dany who worked on the Serval project (France). Dany, Madhur, and I went out after the competition to a chicken restaurant called Tacoya Chicken. The legal drinking age in Korea is 19, so I had my first legal drink ever in the form of Cass beer at the restaurant. It was actually probably the best beer I’ve ever tasted. 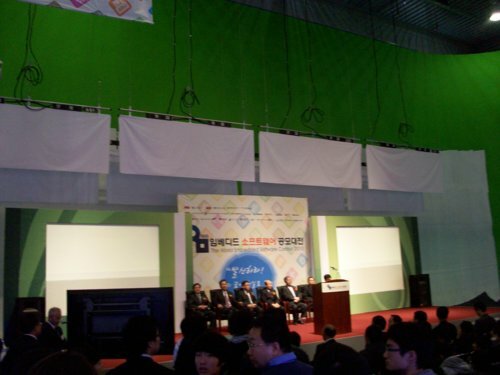 After the competition, all of the teams broke down their booths and said goodbye to the competition organizers. We said goodbye to Kai and Kristen. Kristen said she had been looking at pictures of Penn’s campus on the Internet and that she wants to come visit sometime.